Once you have established what your end goal with your maketing activities is (eg sale, lead etc) you can create a simple KPI framework that will help you understand if your website needs improving to investing and evaluating marketing activities which should follow the flow of the different states. See this as a framework to defining the most important questions you want answered on a regular basis and important enough to be monitored. The benefit of looking holistically and mapping this against your customers path to purchase, (eg. see, think, do and care – or any other preferred model) is that you look beyond the end goal of just generating sales. In order to be able to improve your entire customer journey and your marketing activities you need to understand the said journey to be able to build relevant content for each stage, that means you cannot only focus on generating sales as a KPI, in order to get to the end KPI, in this case a sale. 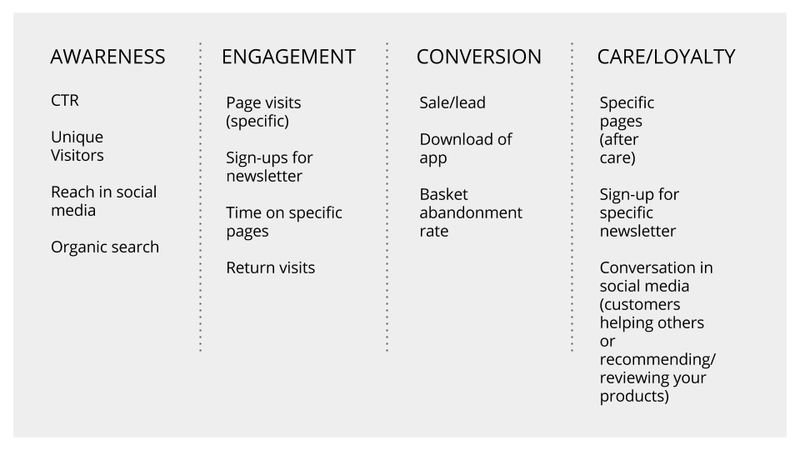 If you want a simple KPI framework template to help you get started, I’ve prepared one for you here. Choose 1-5 performance metrics to track for each step – which is the answer to your questions.